Quotes can be a good tool to help keep your employees focused on safety. Use them in memos, display them on bulletin boards and feature them in employee newsletters on a regular basis. The key to using safety quotes effectively is to find ones that help you get your point across in a way that will be particularly meaningful to your employees, as well as easy to remember. Quotes can encourage employees to think before acting and to be mindful of the safety-related consequences of their actions. 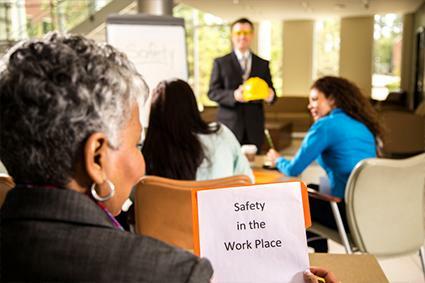 Quotes can help remind employees that it's critical to follow safety procedures. Sometimes managers have to be reminded of the important role they play in safety. Office workers sometimes think that safety isn't something that they need to worry about since they aren't working in an environment traditionally considered dangerous. Quotes about ergonomics can help clear up this misconception. You can find quotes related to safety in any of the available literature on workplace safety. Quoting current official statistics can provide perspective to how common some types of safety-related problems and injuries really are. The Commonly Used Statistics page on OSHA's website is a great resource for this kind of information. The Injuries, Illnesses, and Fatalities (IIF) program of the Bureau of Labor Statistics is also a good resource for statistical information to quote. Magazines with an editorial focus on workplace safety issues are a great place to find quotes related to important and current safety issues. Publications where you can find good articles, often with quotable phrases, include Workforce Magazine, EHS Today and Safety+Health Magazine, a publication of the National Safety Council. There are a number of good blogs that emphasize workplace safety. As blogs are updated frequently, they are a great resource for finding new quote material on current safety issues, as well as best practices, tips and more. The National Safety Council has a blog with a lot of great information related to workplace safety. For articles related to liability and compliance, Workplace Safety and Health Law Blog from Fisher & Phillips Attorneys at Law is a good option. Relevant quotes can be very beneficial when it comes to communicate key concepts related to safety at work. Any time you have an important point to make, take the time to consider if there is a quote you can use to back up, illustrate or bring to life the point you are trying to convey. Slogans and pictures can also be beneficial. Use all of the resources at your disposal to effectively communicate safety concerns.